I realized today I haven’t written an update about Eloise in a while! So, here’s some quick info on where we’re at with her foot. (If you want to catch up on what’s going on with her you can do so here and here). Yesterday we had an appointment with pediatric orthopedics to get some x-rays done and just confirm that nothing is wrong with Eloise’s hips, knees, or feet that could be causing her right foot to turn in. The x-rays came back all normal, which means that the cause of her in-turned foot is neurological. That means that it’s stemming from the brain, not from any deformity in her bone structure. This is what we were expecting as we are pretty sure her condition stems from a brain injury or disease as an infant. The orthopedist is pretty sure she does not have cerebral palsy but a possible mild form of dystonia is still on the table. He mentioned Botox as a possible option in the future and also mentioned that in a year we can reassess if she needs to continue wearing her brace or not. He was positive and encouraging, saying that her condition is very mild and he expects it to stay that way! 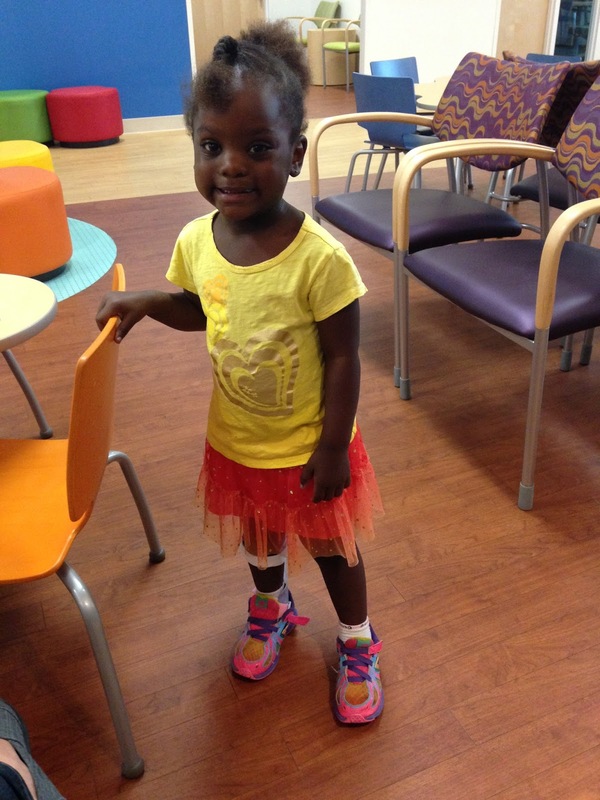 We have appointments to see all of her doctors (pediatric physiatrist, neurologist, orthopedist, etc) again in 6-12 months, at which time they’ll reassess her condition and treatment. 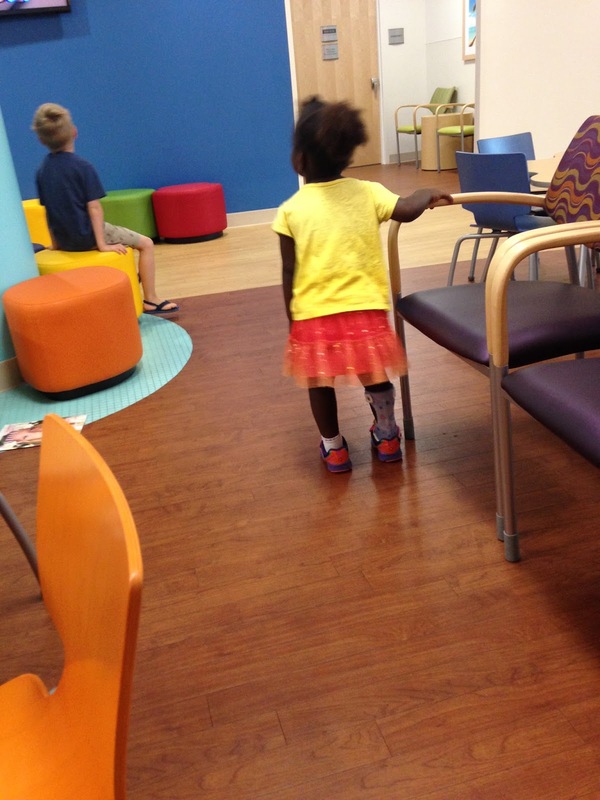 When she first got her brace a few months ago, she started out with a smaller brace that just reached the ankle but her physical therapist wasn’t happy with it as it didn’t seem to do much to straighten out her foot. 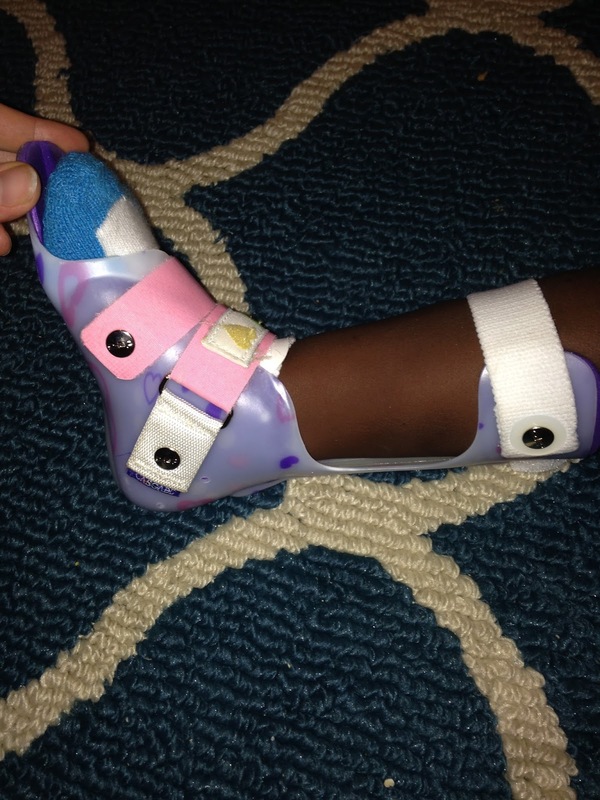 Yesterday she got a new brace, one that reaches half way up her calf and controls her leg much more. 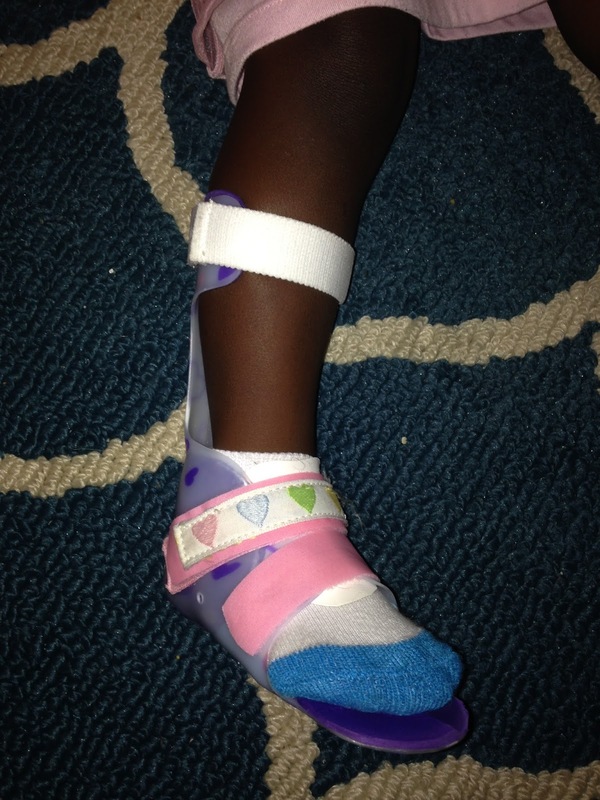 I do think her foot is pretty straight with this one on and am hoping that I can get her to wear it enough to help retrain her leg/brain how her foot is supposed to turn when she walks! Eloise also gets something called kinesio tape at each PT visit. It’s a blue tape that the therapist wraps up her leg that pulls on the muscles in her leg, teaching them to pull outward instead of inward when she walks. The tape stays on for about 5 days, then falls off, then she gets more at her next appointment. Overall we are hopeful! We don’t know if her condition will worsen over time. We don’t know if it will ever be corrected. We don’t know if we’ll ever know what is causing it. But one thing we know is that the Lord keeps giving us the strength to deal with each new development, each new doctors appointment (God knows how hard it is to take 3 kids to the doctor by myself! ), and whatever each day brings. 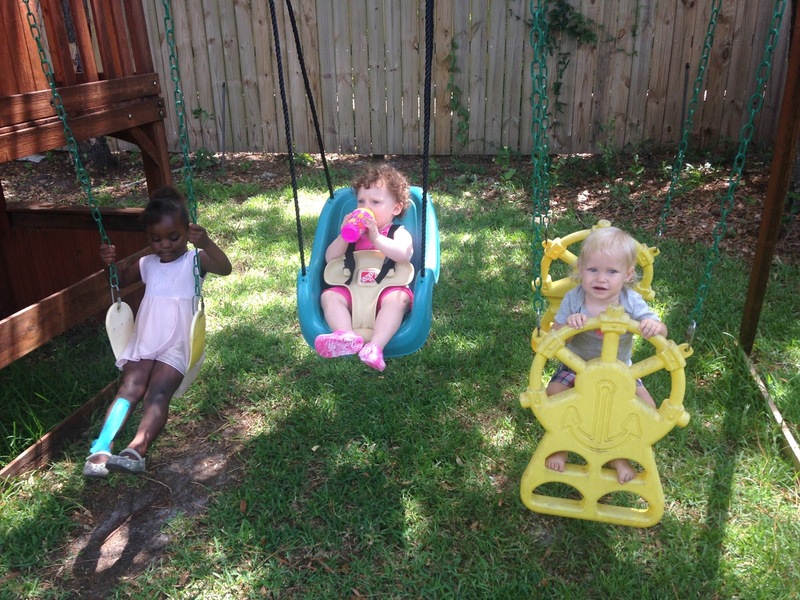 For now we are thankful for a sweet, happy girl who doesn’t let a little in-turned foot keep her from much of anything! Praise Him!!! Thank you, Rebekah!! I hope so too! I am already getting weary of so many doctors appointments for her but am glad that we're able to get her seen by who she needs to see! !